Ringgold Telephone Archives · Stop the Cap! AT&T and some of Georgia’s cable operators are under attack by telephone customers outraged to learn of a plan to force two independent phone companies to raise their rates because some think they charge too little. 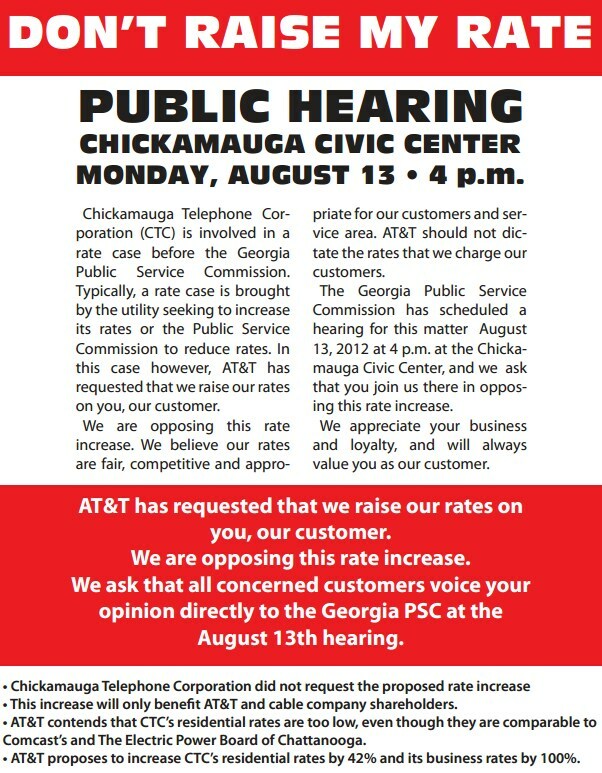 Residents packed the Chickamauga Civic Center Monday night to loudly protest an effort by AT&T and the Georgia Cable TV Association to force both Chickmauga and Ringgold Telephone to raise their rates, in some cases by 100 percent. Retirees complained the rate increases demanded by AT&T and cable operators were unaffordable, with residential customers facing hikes of 42% for phone service. AT&T claims both phone companies are subsidizing their rates with money from the Universal Service Fund to an artificially low level. AT&T rates are considerably higher, and now AT&T wants the two independents to raise their rates accordingly. If AT&T has their way with the Georgia Public Service Commission, Chickamauga residential customers currently paying $13.30 per month will be billed $18.83 per month for basic phone service with a limited local calling area. Business customer rates would double from $20.40 to $40.80 per month. Local businesses and politicians are complaining loudly about the proposal, and want AT&T to mind its own business. AT&T does not directly compete with landline service in the area, considered a suburb of nearby Chattanooga, Tenn. But cable operators do compete and AT&T sells cell phone service locally. State regulators told the Times Free Press the Commission was unlikely to approve the kind of rate increase being demanded by AT&T. But they may approve a cut in state subsidies received by Chickamauga and Ringgold telephone companies, which would likely force both to raise rates anyway. Chickamauga city manager John Culpepper said the city alone is looking at paying $200 more per month — money that will ultimately fall on the taxpayer. Culpepper says independent small businesses are already having a hard time competing with corporate America. Normally, telephone companies looking for a rate increase file a request themselves with state regulators to charge customers more for service. But in Georgia, AT&T, Comcast, and the state cable lobbying group are asking the Georgia Public Service Commission (GPSC) to order two rural phone companies to raise rates because they are not “charging enough” for phone service, when compared with cable telephone services and AT&T. The Ringgold Telephone Company (RTC) and Chickamauga Telephone Company both argue the action is anti-competitive. “By forcing [both companies] to increase rates, these competitors are seeking to make wireless and cable companies more attractive to consumers,” says the Don’t Raise My Rate website. The independent phone companies are vehemently against raising their rates, and executives at both companies are outraged AT&T and the state’s cable companies are literally trying to force the GPSC to order rate increases on residential and business customers. The Georgia Public Service Commission will decide on Oct. 16 whether the rate increases are justified, following local public hearings Aug. 13. AT&T, which is driving the campaign to force customers to pay higher rates, says they are pressing the case because both companies unfairly charge substantially lower rates than AT&T does in Georgia. Peter F. Martin, vice president for legislative and regulatory affairs in Georgia openly admits he wants both companies to charge essentially the same prices AT&T bills its customers in other areas of the state. For customers of Chickamauga Telephone, that would amount to a 42% rate increase on residential customers, 100% on business customers. Customers of RTC would pay 20 percent more for residential service, 37% more for business service. AT&T claims both companies, in deeply rural Georgia, are tapping into the state’s rural service fund and are receiving some of the largest state-mandated telecom subsidies, which are funded by all of Georgia’s phone companies and ratepayers. But both companies claim they have spent a large portion of those funds repairing damages to their rural networks incurred from a series of tornadoes which hit the area two years in a row. 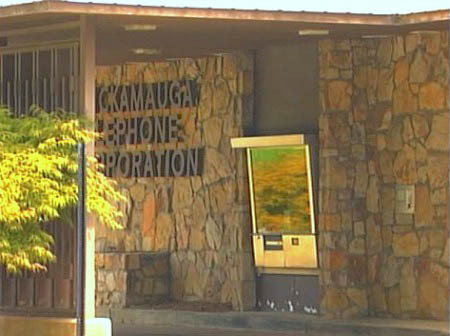 Chickamauga Telephone executives argue Georgia’s telephone deregulation policies are heavily weighted in favor of huge phone and cable companies and leave independent, rural phone companies with no new revenue opportunities. Chickamauga argues AT&T and the cable industry are using legislatively imposed “unfunded mandates” to win favor and additional profits for themselves and their shareholders, with no resulting savings for Georgia ratepayers, especially in rural areas. Tiny Ringgold Telephone, which serves 122 square miles of northwestern Georgia, has pulled the plug on the company’s own video IPTV package and is encouraging customers to watch all of their television shows online or through a satellite TV package offered by DISH Network. Ringgold was in the IPTV business long before AT&T began offering U-verse, having launched video over phone lines back in 2003. The phone company invested heavily in producing local programming for their customers, including local sports, issues in the news, health and fitness, and educational shows for and about the region. The hope was that the phone company would give cable subscribers enough reasons to cut the cable cord for good. They’ve invested heavily to remain on the cutting edge, something uncommon for traditional wireline phone companies. In 2000, Ringgold announced they would deliver a High Speed Internet connection to every single customer who wanted it throughout their entire service area. The company has continuously upgraded their facilities, offering traditional copper wire customers bonded DSL service up to 25Mbps and their growing number of fiber customers speeds up to 50/50Mbps. That’s an enormous difference over other nearby providers, including AT&T, Frontier Communications, and CenturyLink which deliver customers 1-3Mbps DSL with no fiber in sight. The other alternative is service from Charter Cable, among the worst-rated cable companies in the country. But that level of innovation isn’t unusual for Ringgold, which has outpaced traditional Bell System phone companies since it was first founded in 1912 with just eight telephone lines. In 1950, Ringgold was among the first independent companies in Georgia to switch from manual to dial telephones. By the 1990s, Ringgold realized the future was in fiber optics, and planned to replace a significant amount of copper wiring that had been on phone poles for decades. The phone company thought it had mastered the ultimate triple-play fiber-optics package of voice, broadband, and television, until their small size got in the way. Ringgold discovered that “bigger is better” in the pay television business. The largest cable operators enjoy the best bargaining power for just about everything. Companies like Comcast and Time Warner Cable can use their enormous customer base to negotiate cut rate pricing on programming and equipment and stand-up to greedy programmers that demand excessive payments for programming. Ringgold discovered they can’t. The company’s video lineup, due to wholesale costs, was inferior to that offered by the local cable company. Ringgold's broadband network is superior to anything the competition offers in northwestern Georgia. With these challenges, the phone company decided enough was enough and dropped its video package, redirecting customers to DISH Network for satellite-TV, and more recently to online Internet video as an alternative to pay television. Something you won't likely see from your cable company. While most broadband providers treat online video as a parasite, Ringgold sees it as the ultimate business opportunity to reinvent themselves through their broadband service — selling super high speed access to content that someone else provides and has to worry about. They’re considering a new customer promotion that includes a Roku, Apple TV, or Clearleap-powered set-top box to integrate broadband connections with television sets. The company is even educating customers about the growing number of programs available for free (or with a low cost subscription) online with an interactive web tool. Ringgold’s new solution for online video also includes some small revenge on high programming costs, giving subscribers an integrated over-the-air antenna system that can pick up nearly a dozen HD channels, including that NBC station, for free.